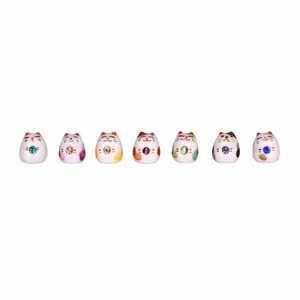 A set of seven tiny mini manekineko cats (1.5cm) with feng-shui colours. Please note each cat is holding a coloured jewel which doesn't necessarily match the cats own colouring (for example the gold cat is holding a blue jewel). Feng shui colours: red - wards of illness, yellow - money, gold - fortune, white - luck, green - health, black - wards off evil, pink - love, blue- success.